I love the look of this card. I have some embossed flowers ready to go--now I'll try coloring them as you suggest--thanks! Love the beautiful colors. Will have to try this on the weekend. 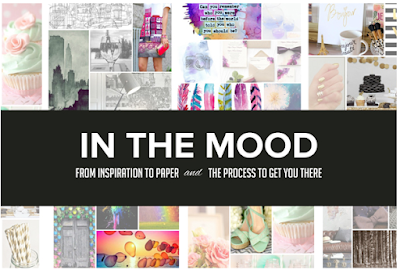 I just added your beautiful mood board to my Pinterest folder [hope that is okay]-- stunning, as is your card! What a pretty card! The colors are great together! Maureen - this is so lovely; I think that you captured the mood board. Love your watercolor butterfly, Maureen! The black card stock and sentiment are perfect in this! Wow, Mo, your watercoloring is gawjus, Sistah! Love this card and adore this inspiration board! Pretty watercolors and I love the pops of black! My goodness Maureen! You are an amazing crafter - you never cease to amaze me! Totally love the watercolor effect, those colours and your beautiful butterfly! A stunner! Not only would I love to win this class, I'd love to CASE your card Maureen!!! So beautiful! Love your moodboard, Maureen, and your card is simply stunning. This new class looks very interesting. Thanks for the chance to win a free spot. Maureen, this is stunning! Beautiful colors and a technique I think I can do! Thanks for all the inspiration and the chance to win a class spot. What a gorgeous card!! Love those colors!! Love your card! That background is gorgeous! Like how you tied the butterfly in also. Thanks for the idea to highlight the image with a piece of black offset behind it. Would love to win this class as mood boards are very interesting! Stunning, Maureen. What a beautiful blend of colors. I can't wait to try this one, although I'm sure I'll be using a lot of "test" paper first!!! : ) THANKS FOR THE IDEA!!! Beautiful card, your directions make it seem easy. I will have to try it because of your inspiration. Thank you for a chance to win. This card is Awesome, and so are you! Gorgeous card! Love the color combo and the beautiful butterfly! Gorgeous butterfly, Maureen! Thanks for putting together all our amazing mood boards for this class! Gorgeous! I love the watercolor look. Gorgeous water color & love the pops of black! I love the colors in this inspiration. The distress inks are a perfect coloring medium. Thanks. Beautiful card! Love the colors!!! The butterfly really pops off the card. hi there.. maureen... gorgeous idea/technique used from mood board... wish you lots of fun as a teacher there.. and u r a gr8 artist and so generous of you to give of your time and efforts into teaching.. 3cheers..."glow"
Oh, the purple and blue are perfect on that butterfly! Love the black accents and sentiment strip! Your card is very lovely. what a wonderful technique to use on this. Oh, this class sounds great! And I love your gorgeous card, Maureen! Lovely butterfly card. Distress Inks are so much fun to work with. I just love seeing what they do when combined with water. 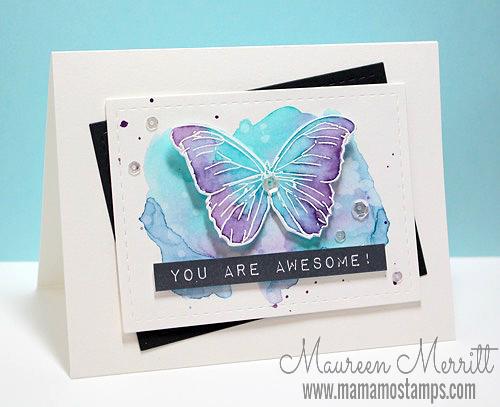 Your card is gorgeous, my favorite colors and the embossing on the butterfly is so pretty. I can understand how the mood boards would be a huge help when the mojo just won't come...thanks for allowing us to enter for this great prize! I sure like this butterfly card can't wait to try! The colors on this mood board are my favorites. I really love your card! Your card is beautiful! The class looks very intriguing! Beautiful watercolor card. I love this color combo! Such a beautiful card. Love the butterfly and the background. I like how you put the black behind and how it was offset. so pretty! thanks for the tip of drying sections before moving on! Lovely card with beautiful colors! Thanks for sharing. I love everything about this card. Thank you for the inspiration. Love..love the angled paper idea and of course, those colours!!! Love this technique. Can hardly wait to try...now to go get some watercolour paper! I just love using distress inks. They give you freedom and movement with the colors! Beautiful. Gorgeous card! I have got to start watercoloring............I just love the look! And I would love to be able to win this class! I love the mood board and the gorgeous card you made using the inspiration. I love the simplicity and the beauty of all your creations. Love the mood board & your gorgeous card! Thanks so much for the great tutorial on coloring the butterfly. I'm going to try my own this evening. Stunning card! Love the colors and the butterfly image. What a stunning card, the colors are just perfect and the watercoloring is gorgeous! Knocked it out of the park again...! What a beautiful butterfly card! Thanks for the water color tips! The black sets off the watercolouring sooooo beautifully. I am loving the class so far! THis is a gorgeous card Maureen. Thanks a lot for all the tips on how to make it. And that's a very inspirational mood board. I am loving these colours and this butterfly has made me really really want to subscribe! The card is gorgeous! Love the watercolor and dimension! Gorgeous!! Great interpretation of this mood board. I love how your butterfly blends with the background colors. Your card is gorgeous and as inspiring as the mood board! Your card is beautiful. I can't wait to try the technique. An awesome interpretation for this mood board! Maureen, your card is just "WOW". The colors on the butterfly are incredible the way they blended. The back card stock just makes those colors pop. Great job, my lady. This combination of colors is absolutely striking! Love your water drops that you lifted some of the color. So delightful to look at - thanks for the inspiration! So pretty! Love how you interpreted the mood board. Thanks for sharing this lovely card. The colors on this mood board are a great inspiration. And Thanks for sharing the great recipe for "CAS"ing this card. love the butterfly,pretty card! The colors are great together! I just love the colour combination and of course the butterfly. Your card is wonderful. Beautiful--I like how you melded these ideas together. Oh my, I just love the combined colors Dusty Concord and Peacock Feathers and will use them on my next project. I haven't done this watercolor technique yet but I can't wait to give it a go. Thanks so much for sharing and WELL DONE! i feel the urge to pull out my inks and play! I am so loving the watercolor effects and I totally dig the purple and teal butterfly. Beautiful! I love the colors used in this hop. Stunning! These are my favorite colors. That butterfly is beautiful! I love those colors together. I really enjoyed the whimsical way that you put the layers on this card. The colors are just wonderful too. Omg. That card is truly awesome...looks like the class will be too. I really love these colors. they are really right up my alley. I love getting new ideas of how to combine them. this card is so lovely! thanks for sharing. OMG this card is so beautiful! Love it. stunning Maureen. Your watercoloured butterfly is amazing. Just love this card. I absolutely love this mood board. Such great colors to inspire beautiful works like yours. This makes me want to create. Those are my most favorite colors!! And that watercolor butterfly is amazing! Would love to know more about mood boards and how to use them! I sure do pin a lot of these types of ensembles on pinterest! I'd love to put them to good use! Have a Blessed Day!! Love how you have used the inks to get such wonderful water colour effects. Gorgeous watercolouring! Thanks for the inspiration. Ohhhhhh! Love the colors. Butterflies are my favorite. I am in love with your card! It is gorgeous! Love the butterfly (addicted to them), the color combination, the technique, everything! L.O.V.E!! I'm in love with this stunning mood board! And your card is simply gorgeous! I need to uncover my embossing tool so I can "watercolor" within the lines. Thx for the beautiful sample. Beautiful card, love those colours together for a butterfly. 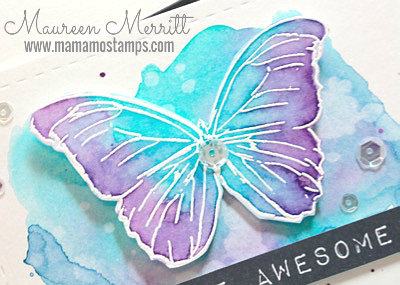 Love the watercolored butterfly on the watercolored background, beautiful - an artsy CAS card! Love the colors and your technique. Can't wait to try it. I just love butterflies. beautiful watercolor card. thanks for the technique tips too! The class sounds amazing! Love love the card! Especially the butterfly. Vi-de-o, Vi-de-o, Vi-de-o, please, please please! Love how you used the black framing to set off your beautiful colorful pieces! Straight from the butterfly in the inspiration piece! Absolutely gorgeous! Thank you for taking us through each step, too. Butterflies on everything..I say!! Lol Thanks again. Love the card and colors used! Love this card! This is one I'll definitely be trying on my own. So inspired by the beautiful colors!!.. Can hardly wait to try this technique. I love the colours you have used and butterflies are always a winner. Using inks on watercolour card is something I haven't tried but after seeing this blog hop I have been to my local craft shop and purchased the paper so will definitely be trying this myself. A totally GORGEOUS card, thanks Maureen I'm inspired. A fantastic result with this wonderful color combination. Your colors are spot-on. Beautifully intense. I love your watercolouring! Beautiful. More beautiful butterflies, love them and the composition. Oh wow this class sounds great! I love the watercoloring techniques used in your card. 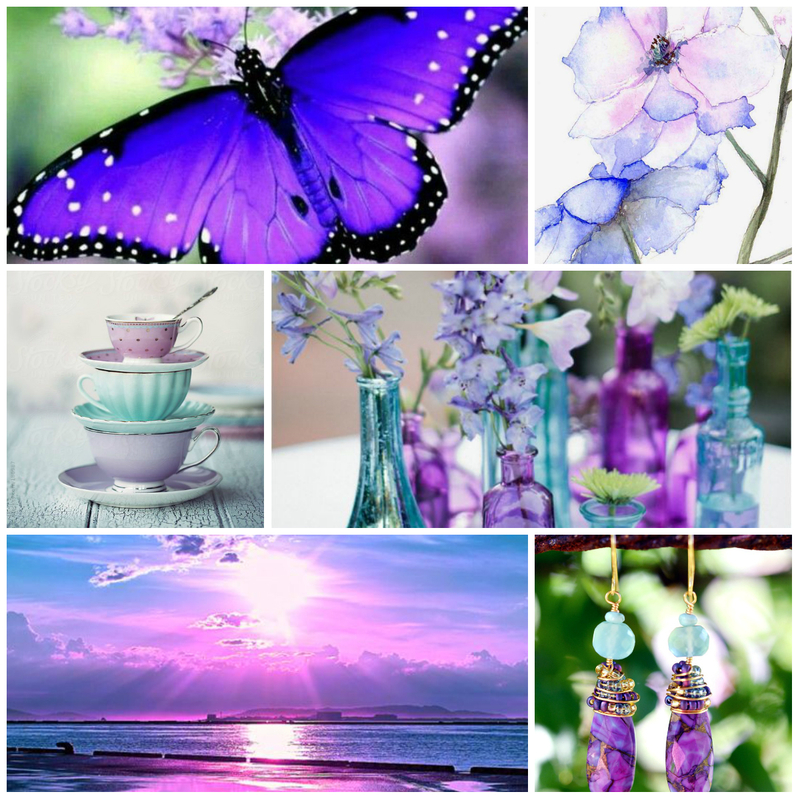 The colors in the mood board are beautiful! Watercoloring techniques really catch my attention. Your card is beautiful. This is such an exquisite card. I love this technique and your card is beautiful done with watercolor. Pinned! LOVE THIS CARD! ESPECIALLY THE WATERCOOLOURS! Beautiful card! Love the butterfly! I am loving the colors of the Mood Board and your card is just gorgeous. I am such a sucker for butterflies! Your card is sooooooooooo beautiful. Loving the colors of the Mood Board. I love the colors... Excellent job. Can't wait to try this. Love the card!! Wonderful. You can't go wrong with a butterfly and the beautiful colors. Thanks for the tutorial. Can't wait to try it. Love the colors. You designers are very inspiring. Beautiful card and technique with the distress inks. I like the off-set piece of black cardstock . Can't explain why, but I do! Beautiful card! Your card is just gorgeous. I love the colors. Mood boards - what a great idea for a blog hop. May try it myself as a different way to get inspiration. Love your card. Its so peaceful. Last attempt to get this to post. Loved your card and how beautifully it turned out. Wonderful inspiration. love the colors! Thank you for sharing and for the chance to win a spot in the class. Sounds like a lot of fun! Butterflies are my favorite and yours are so beautiful. The card is so pretty and I love the butterfly. Love, love, love your card! Beautiful!